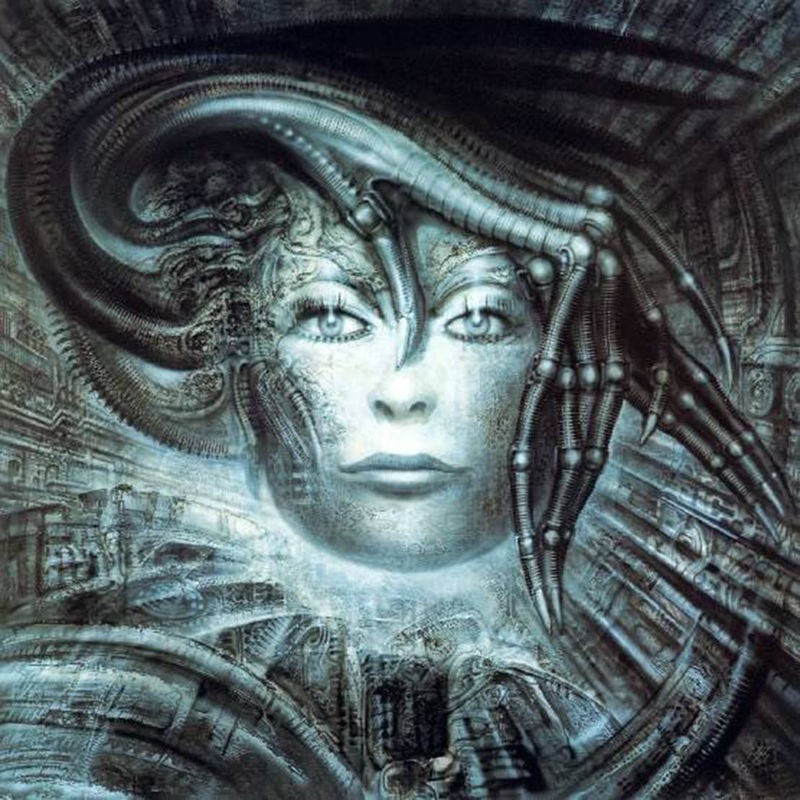 Alien Explorations: HR Giger: Carmen I (work 618) (1988/1989) references Radio Times illustrations for the Proms 88? 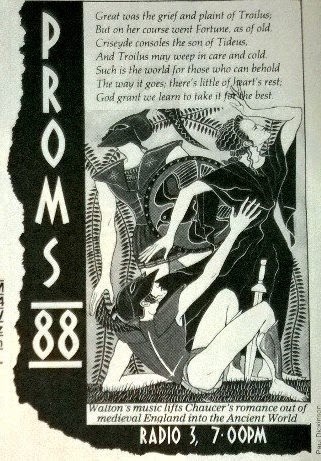 HR Giger: Carmen I (work 618) (1988/1989) references Radio Times illustrations for the Proms 88? On August the 8th, 2018, I noticed more Radio Times images posted by Graeme Wood on Twitter https://twitter.com/woodg31 I noticed one image that stood out, somehow I thought it connected with the painting Carmen I done around the same year and then I noticed another illustration that also connected with that sense of association. b) References Proms illustration for Radio Times, 3rd August, 1988? Radio Times image reversed side by side with Giger's painting. What this would show is that the stretched out arm of the man on the ground would become the biomechanic forms on Carmen's left cheek. The lower arm of the woman becomes the the thumb in between her eyes. The ferns like forms on the right become the ribbing alog the upper part of the hand and the fingers. The head of the old woman becomes the space between the wrist of the hand and the head, so it would be as if the upper part of her body and her raised arm have contributed to the form of the tentacle coming out of Carmen's head bending upwards to connect with the large hand. 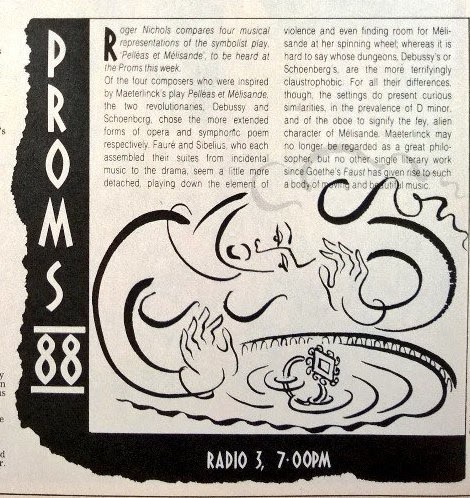 c) References Radio Times illustration for the Proms 88, 7th August 1988? Two images side by side. 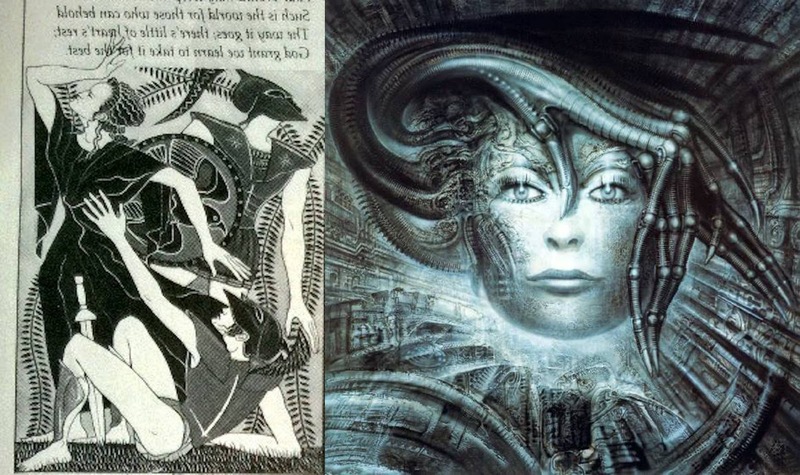 The left arm on the reversed image becomes the tentacles coming out of the left of Carmen's head. A first thought might be that her breasts perhaps becomes Carmen's eyes, but perhaps the mouth of the woman became the right eye as a point of reference in the layout of the composition. The arm on the right that reaches lower down becomes piping in the wall on the right curving down to the bottom while the rim of the pool becomes the curved piping on the bottom of the right of the painting.